The all-new Ford Ranger midsize pickup truck is being tested as we speak by robots who are going to ensure this is the best Ranger in years. The robotic testing of the new 2019 Ford Ranger goes to the extreme to make sure you have the best quality ride. Days and days of continuous shaking are done by machines so squeaks and rattles don't ruin your ride. In an effort to make certain the new 2019 Ford Ranger be able to run effortlessly all year, the truck is run through heavy testing in the coldest and hottest extremes. The truck will haul and pull thousands of pounds for days to make sure it is able to perform when you need it most. 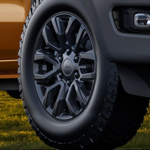 If you are interested in the 2019 Ford Ranger, call our team at Mullinax Ford of Kissimmee and we will reach out to you the second we have them on the lot. Find a New Ford Truck Today!